Ebook: The focus is learning basic math skills. 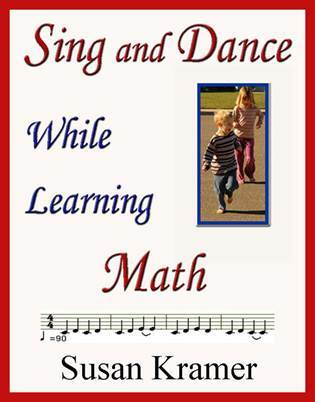 The songs, when danced, help instill in the student the "meaning" of counting, addition, subtraction, and sets. It is easiest to learn when several of the senses are used. Body to mind using the senses, and mind to body for action. If students can't sing, clapping may be substituted. Musical scores to songs, and photos of dance movements included. For primary grades. 22 pages. 2,000 words. Rhythmic bodily movement uses both sides of the brain, as the right brain mostly controls the actions of the left side of the body and the left brain mostly controls actions on the right side of the body. Music and movement use both sides of the brain in coordination. Hint: Print out the ebook and 3-hole punch into a binder. Each lesson with music staff and instructions takes one side of an 8.5 by 11 inch page. Susan Kramer is an international author of more than 50 books and thousands of articles on rhythmic movement, contemporary dance, ballet, music, philosophy, relationships, social issues, yoga, meditation, and practical spirituality for children, teens, adults and those challenged, with some translations in Dutch, French, German, Greek, and Spanish, and with her husband, Stan Schaap, lives in North Holland. A special thanks to Kees Schaap for feedback and testing the musical scores.